Elias P. Demetracopoulos, a dissident and onetime stateless Greek journalist who exiled himself to Washington, where he stoked opposition to the military junta that ruled his country from 1967 to 1974 and to U.S. officials — including members of the Nixon administration — who supported that regime, died Feb. 16 in Athens. He was 87. Mr. Demetracopoulos played a peculiar and at times divisive role in Washington for decades, beginning in 1967, when he came to the United States from Greece after the military coup led by Greek army colonel George Papadopoulos. The rightist, anti-communist regime received U.S. backing despite reports of its repressive tactics, which included the imprisonment and torture of political opponents. Mr. Demetracopoulos’s Greek citizenship was revoked in 1970 and was not reinstated until 1974, when the junta was deposed. The son of an archaeological guide at the Acropolis, he spoke fluent English and had been well known in Athens and Washington since the 1950s as a political and diplomatic reporter for Greek newspapers including Kathimerini, Ethnos and Makedonia, Barron said. In the United States, he supported himself as a consultant to Wall Street firms including Brimberg & Co. while leading a single-minded lobbying campaign against the Greek military government. His activities won the respect of a contingent of Washington policymakers, including Sen. George McGovern (D-S.D. ), but also attracted the unfriendly attention of the State Department, the FBI, the CIA — which Mr. Demetracopoulos said was “after my scalp” — and Nixon administration officials. Mr. Demetracopoulos’s conflict with the Nixon administration began during the 1968 presidential campaign, when Maryland governor and Nixon running mate Spiro T. Agnew, who was of Greek heritage, gave public remarks in which he appeared to endorse the military junta because it provided a counterbalance to communism in Greece. Specifically, Mr. Demetracopoulos recalled in his 1997 article, he learned that $549,000 in cash was funneled to the Nixon campaign from the KYP, the Greek intelligence agency, through a Greek American businessman, Thomas Pappas. Mr. Demetracopoulos said that he shared that information in 1968 with Lawrence F. O’Brien, then chairman of the Democratic National Committee. Mr. Demetracopoulos later lobbied a congressional subcommittee about Pappas’s influence in U.S. government policy, according to newspaper accounts. Mr. Demetracopoulos linked the alleged campaign donation to the burglary of the Democratic national headquarters at the Watergate complex in 1972, the event whose coverup ultimately led to Nixon’s resignation in 1974. The Post reported in 1983 that although his claims about Pappas and the junta’s campaign donations had “made their way into the press and the political lore of Washington,” they were unproved. They would continue to circulate among some Watergate buffs, however. In 1997, transcripts of the Nixon tapes, obtained by Stanley Kutler, a historian and respected constitutional scholar, revealed Nixon apparently thanking Pappas for obtaining funds used as hush money for Watergate burglars, although ambiguity would continue to cloud the matter. Mr. Demetracopoulos’s efforts resulted in an acknowledgment in 1984 from FBI Director William H. Webster that six investigations of Mr. Demetracopoulos, conducted between 1964 and 1974, had produced no evidence that he posed a danger to national security. In 1977, the New York Times cited the CIA records as a source in an article suggesting, among other points, that Mr. Demetracopoulos was turned away when he offered to work for U.S. intelligence in 1951 and that he later had ties to Yugoslav and Israeli intelligence. Mr. Demetracopoulos disputed that account. In 1983, in what he described as a “vindication,” the CIA conducted a review that concluded there was nothing in CIA records to support those claims. 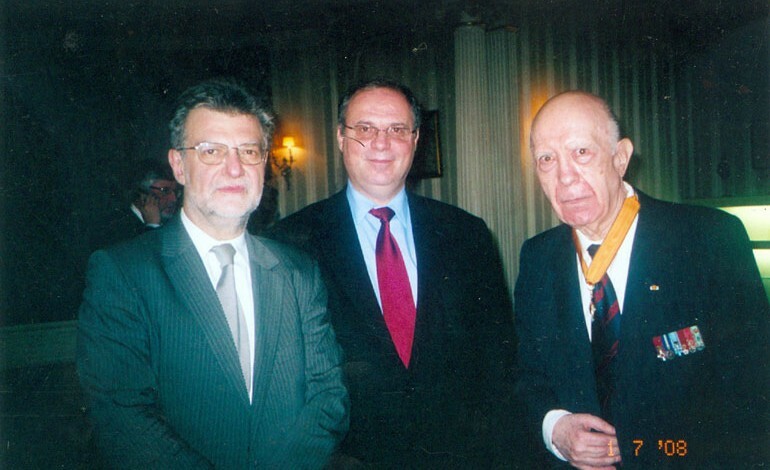 Elias Panayotis Demetracopoulos was born in Athens on Dec. 1, 1928. According to Barron, his biographer, Mr. Demetracopoulos served in the Greek resistance during World War II, using his English skills to help with translation and aiding British and others caught behind Axis lines. Barron also said he unearthed records in Greece indicating that Mr. Demetracopoulos had been imprisoned by the Germans and decorated after the war for heroism. He began his journalism career in 1950, reporting extensively from Washington and on the American diplomatic community in Greece. His marriage to Celia Was ended in divorce. He had no immediate survivors, according to Clifford Hackett, his power of attorney and a longtime friend. In Washington, where he remained active in U.S.-Greek affairs long after the end of the military junta, Mr. Demetracopoulos lived for many years in a one-room apartment at the Fairfax Hotel and dined at the Jockey Club. According to Hackett, he had a “simplicity and directness about his life that baffled people.” His furniture consisted of a sofa bed, a table and chairs. Otherwise filling his apartment were files containing thousand of documents. He returned to Greece in May, when the senior living community where he lived by then was shuttered, according to Hackett. Years ago, The Post had asked Mr. Demetracopoulos why he remained in the U.S. capital even after the junta was gone and his citizenship restored.